Scouts are arranged in different age groups. The youngest section of the Scouts is for Beaver scouts. The Beaver Scout organization accepts members between six and eight years old, and engages them in a 'Balanced Programme' which is intended to encourage socialization and self-discovery. Beaver scouts are encouraged to develop creativity and practical skills while finding out more about the world around them and developing an knowledge of the beliefs and attitudes of others. It is intended that they should they complete the programme and be ready to move to the Cub Scout programme when they are eight years to eight years six months old. The basic idea behind the Beaver Scout programme is that young people can develop themselves and have fun at the same time. Beaver scouts are encouraged to share and work on co-operative projects, and are taught the value of helping others. Playing games and listening to stories are essential parts of the course, and Beaver Scouts are given the chance to try their talent at making things, acting, singing or making music. Beaver scouts usually meet once a week in a Beaver Scout colony, and sometimes they will participate in organized sleepovers - which are sometimes the first time that they have spent a night away from home without their parents. Beaver Scouts wear a distinctive turquoise sweatshirt which displays the badges and awards that the scout has earned. Though emphasis is on giving the children the broad experience of the Balanced Programme, badges and awards are still a vital part of scouting. There are several different classes of badges. Joining in and Group badges. There are often rectangular. 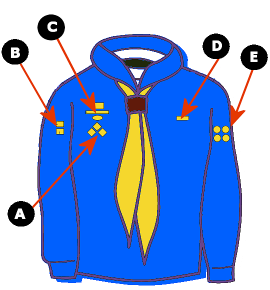 Group badges are generally worn on the right sleeve, or sometimes displayed on the back of the Scout's scarf. Joining in badges are worn on the left of the chest and reflect how long an individual has been associated with the scout movement, and the yellow moving on award is given when the Scout moves to a new level - for example from Beaver to Cub. Activity Badges are circular and worn on the other sleeve to group badges. Gaining activity badges is optional, but they show that the Beaver Scout has learned a skill or particular understanding of an issue. Activity badges include Healthy Eating, where Scouts have to prepare a healthy snack, list some unhealthy foods and be able to make wholesome sandwiches and fruit salads. Earning a Faith badge includes writing a prayer or a reflection on spiritual matters and visiting a place of worship. There are a dozen of these badges, as well as staged activity badges which show the level the Scout has reached in things like information technology, swimming or first aid. Challenge Badges are diamond-shaped and are worn on the other side of the chest from Joining in badges. Unlike Activity badges, Challenges are a part of the Balanced Programme, and Scouts can earn badges for the Outdoor challenge, the Discovery challenge and the Friendship challenge. If a Scout is particularly interested in a particular challenge; that challenge can be completed more than once to earn a second badge, but to get the second badge the scout has to show greater skill and knowledge of the topic. Which is the most appropriate title for section A? Decide from the information in the text whether these statements are true, false or if the information is not given. Write the letter which indicates where the badges for the following achievements would be worn.